This are two full size, full color mounted maps that fold to a size that fits in both the Steam and Age of Steam boxes. At first glance, both have similar rules changes: an option to forsake delivery of goods cubes or an increase of locomotive and replace it with a special function that will be key to winning the game. But the differences between the maps and how they are played are substantial.\n\nCalifornia Gold Rush takes place in the mid 1800’s in Central California. 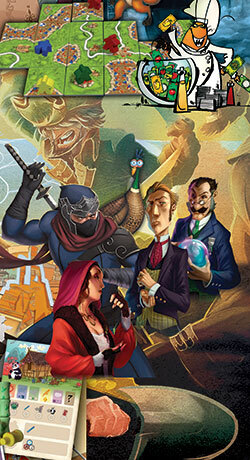 Pockets of gold have been found, and you need to lay claim to the mines before your opponents. To do so you need to build railroads out to the gold mines and pick up the gold. The mechanics are modified slightly during the delivery phase: you always have the option of picking up any available gold cube wherever your track has been laid instead of delivering a regular good cube or increasing your locomotive. At the end of the game, each of the gold cubes increases your income (VPs in Steam) by 5. 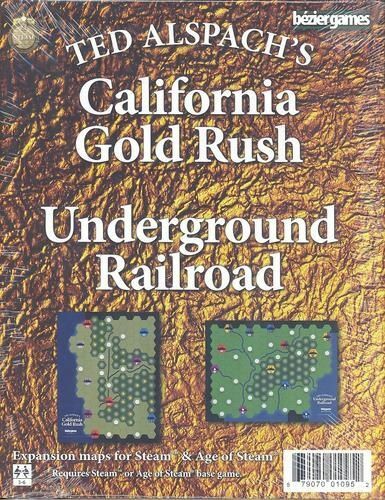 California Gold Rush is for 3-6 players.\n\nUnderground Railroad takes place in the years leading up to the civil war all across the Eastern United States. 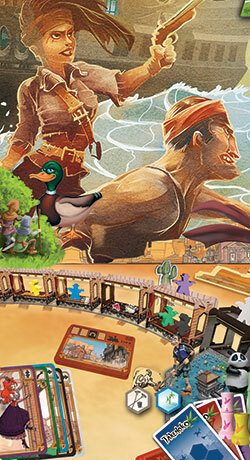 During the goods delivery phase, players may opt to move slaves north to a free city instead of delivering a goods cube or increasing their locomotive. They don’t receive any income for doing so. The winner is determined by who frees the most slaves...as long as they don’t go bankrupt before the end of the game. Underground Railroad is for 3-5 players.